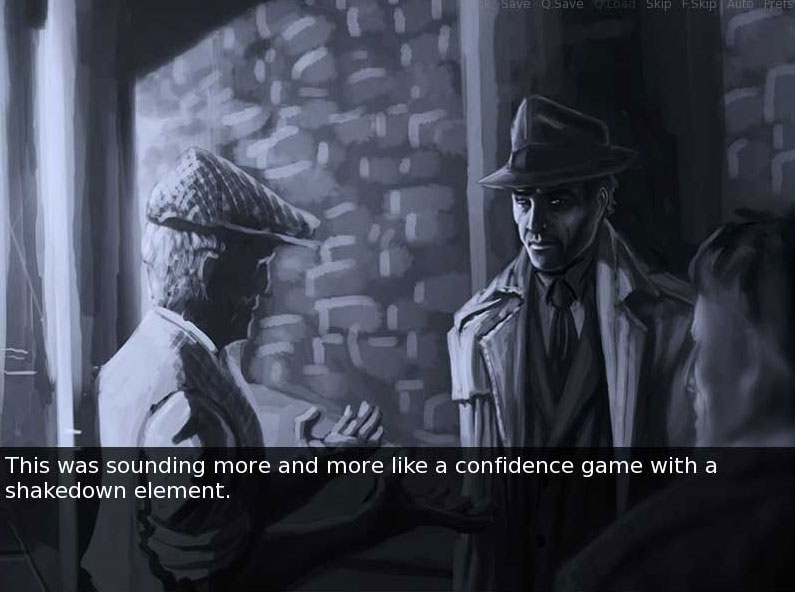 A Visual Novel set in the Deadlands Noir RPG Setting from Savage Worlds. New Orleans, 1935. Whoever called this "The Big Easy" sure got that one wrong. Things are tough all over. Honest work is hard to find, and even dishonest jobs are getting scarce. The one thing that's not in short supply is trouble. From shady thugs to crooked cops to mafia soldiers, there's plenty of characters out there looking to give an honest Joe a hard time. And that's not the worst of it. There are stories going round about things that go bump in the night. Things you wouldn't want to meet in a dark alley on a darker night. And those stories aren't just coming from rummies or saps who read that epitaph rag. Still, there are a few heroes left in the concrete jungle. Steely-eyed private dicks, fast-talking grifters, wild-eyed inventors, and shadowy houngans still struggle against the encroaching darkness. With enough moxie--and more than a little luck--they might just be enough to turn the tide. This is just one story. 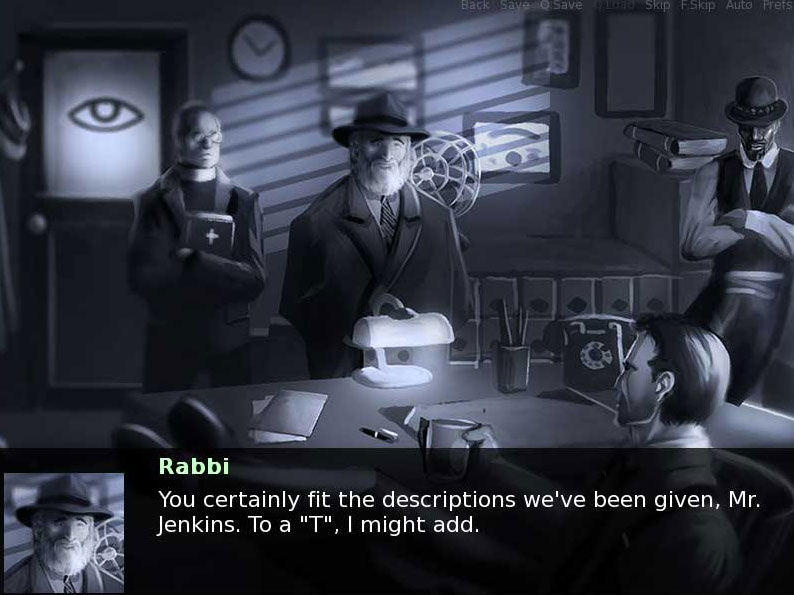 The story of Harvey Jenkins, Private Investigator. This story was written by Sean Patrick Fannon, Lead Designer and Brand Manager for Savage Rifts and author of numerous RPG products such as Shaintar: Legends Arise and The Fantasy Roleplaying Gamer's Bible. The story is set in the Deadlands Noir RPG Setting created by John Goff, Shane Hensley, Clint Black and Sean Preston. The soundtrack was produced by Harry Mack for the Deadlands Noir Kickstarter and has been incorporated here as compelling background music. Cheyenne Wright produced all the images and artwork. 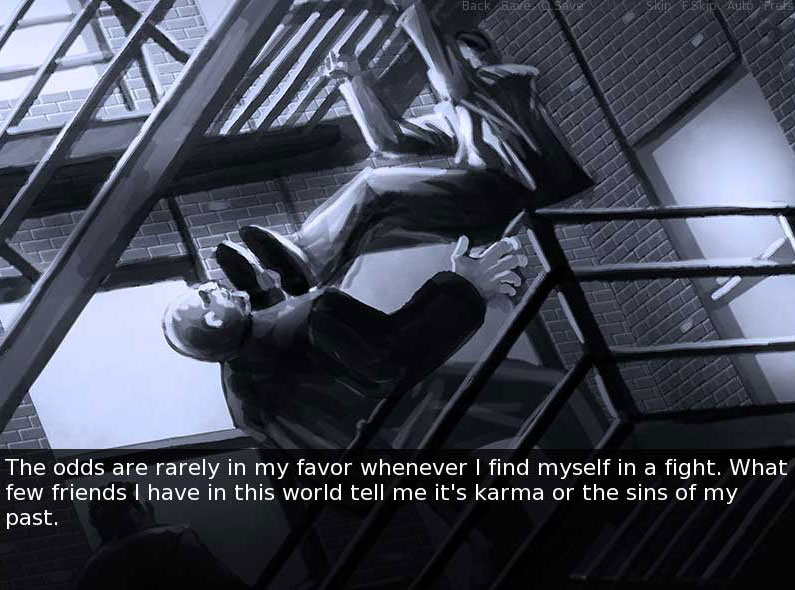 The original concept was produced by Brendan Quinn and converted into it's final form by Doug Davison, using the Ren'Py visual novel creation software. Editing was provided by Sara Quinn. If you like this story, please look for more stories featuring Harvey Jenkins in The Big Easy. 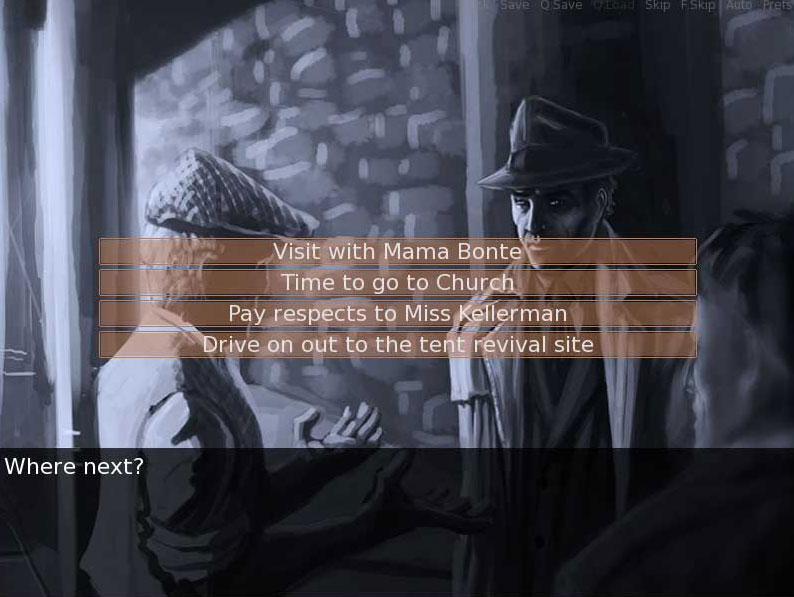 Deadlands Noir - That Old Time Religion was originally written to be a web based Choose-your-own-adventure module. After the initial writing and artwork was done, it was presented to Smiteworks to see if it was something that could be done within Fantasy Grounds. 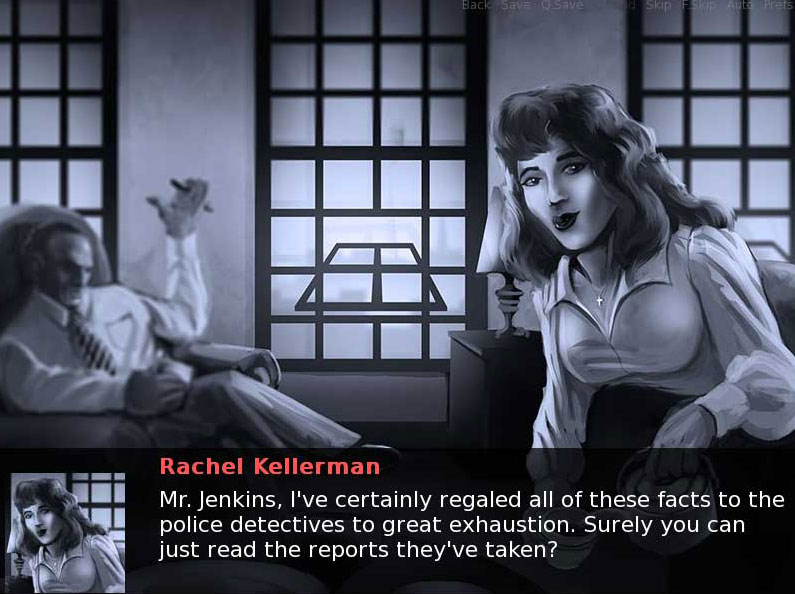 Doug Davison reworked the story and art to fin within a Visual Novel interface using the popular Renpy platform. 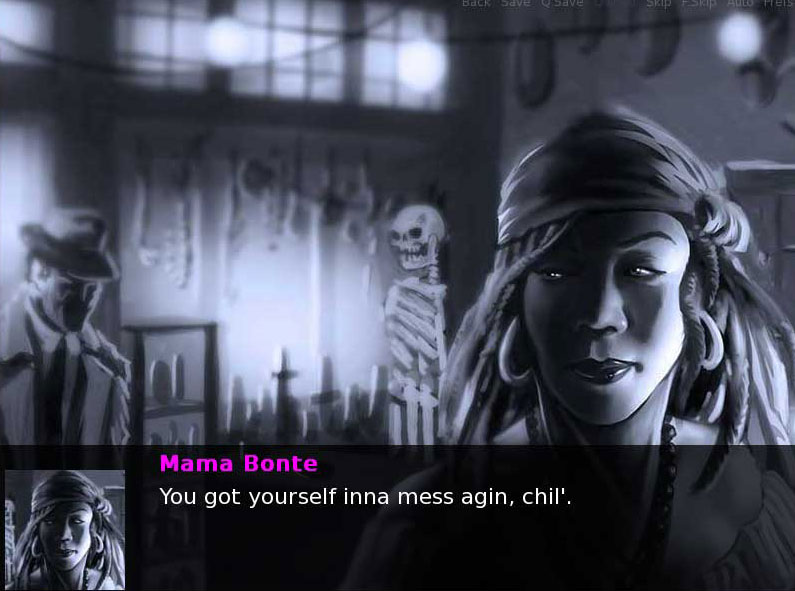 Episode I was released on Steam in July 2015. Additonal episodes will be added to the product over time. A short story meant to introduce readers to the Deadlands Noir setting and some of the characters found in the New Orleans area. 1 hour of background music - classic sleuth music has tons of character - jazzy riffs, slinking symbols. Ambient sections set the mood with dark, surreal backdrops. Access all traditional paraphernalia available at the gaming table. These include dice, drawings, character sheets, portraits, tokens, and rulebook reference material. 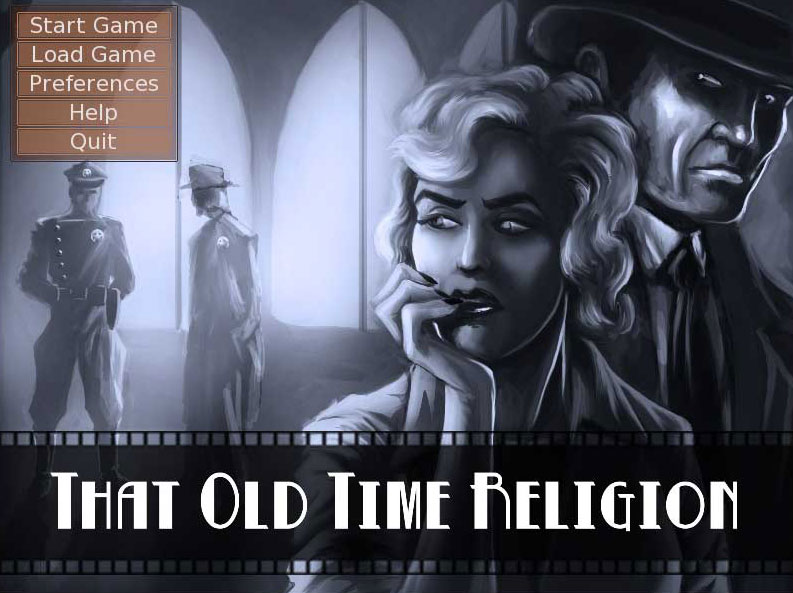 There are currently no trailers available for Deadlands Noir - That Old Time Religion. Check back later for more or contact us for specific requests! There are currently no logos or icons available for Deadlands Noir - That Old Time Religion. Check back later for more or contact us for specific requests! More information on SmiteWorks USA, LLC, our logo & relevant media are available here.